The film from Live Nation Productions and Sean ‘Diddy’ Combs is now available on iTunes! 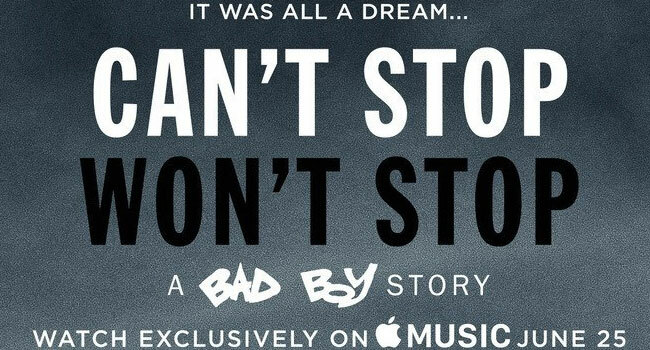 Can’t Stop Won’t Stop: A Bad Boy Story, produced by Sean ‘Diddy’ Combs, and Heather Parry of Live Nation Productions, alongside executive producers Michael Rapino, Andre Harrell and Alex Avant, explores the passion and personalities of Bad Boy and is now available on iTunes and Apple Music. Directed by Daniel Kaufman, Can’t Stop Won’t Stop: A Bad Boy Story is an exclusive look behind the scenes at the history of Bad Boy through a complex portrait of the label’s mastermind, Sean “Diddy” Combs, as he tries to reunite his Bad Boy Family in the course of a frantic three-week rehearsal period. As they prepare to celebrate the label’s 20th anniversary, the film traces Bad Boy’s emergence in Harlem and Brooklyn, follows its meteoric rise, explores the tragic killing of Biggie Smalls, and celebrates Bad Boy’s influence in reshaping music, fashion, marketing and culture. In 1993, Sean “Diddy” Combs, aka Puff Daddy, founded Bad Boy Records, and changed American life forever. In 2016, the Bad Boy Family reunited for the biggest homecoming in hip-hop history, cementing their legacy as a driving force behind music and culture. The film culminates with the May 20th and 21st, 2016 performances at the Barclay’s Center in Brooklyn when iconic artists including Puff Daddy, Lil’ Kim, Mase, Faith Evans, Mario Winans, 112, Total, Carl Thomas and The Lox perform hit after hit to the sold out crowd and leaves the viewer with much more.